Space is a valuable commodity and often in short supply. 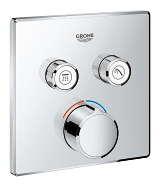 It becomes a challenge for planners and installers to use it effectively. 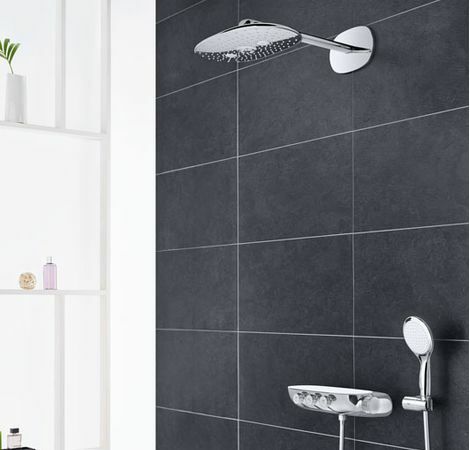 No easy task, especially in the shower area where space is often at a premium. 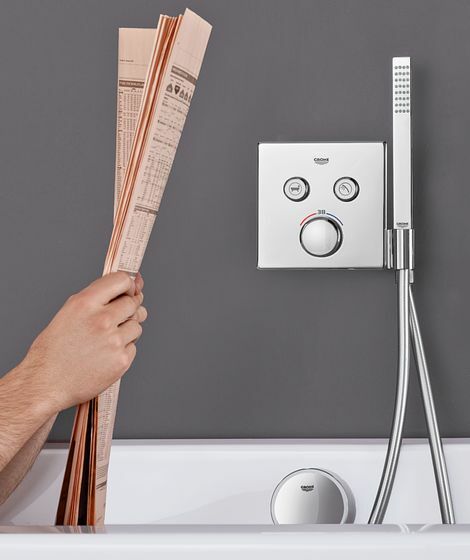 With its concealed installation and exceedingly slim design, GROHE SmartControl Concealed offers more space under the shower without compromising on functionality or comfort. It also offers additional benefits of a practical kind: cleaning becomes faster and more convenient, thanks to the flat, streamlined design. 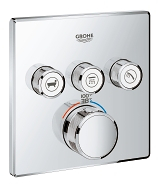 Flexibility of design: GROHE SmartControl Concealed also offers a multitude of design variants. 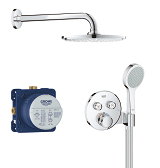 A wide selection of suitable trim sets and showers ensures that the style chosen for the bathroom extends seamlessly into the shower area. Concealed technology: more in it for you. 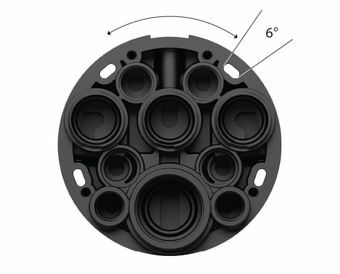 No matter what the installation depth of the rough-in is, the total height of the trim never exceeds 43 mm. The GROHE SmartControl Concealed combines space-saving convenience in the shower and slim good looks. 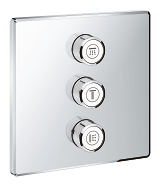 With a height of only 10 mm, its super slim design makes the GROHE SmartControl Concealed wall plate both elegant and space saving. The GROHE SmartControl Concealed has an integrated sealing system, completely eliminating water behind the wall. 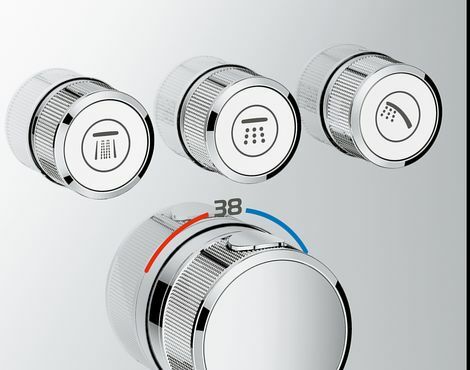 The control knobs come with a range of different symbols, representing the different shower options. 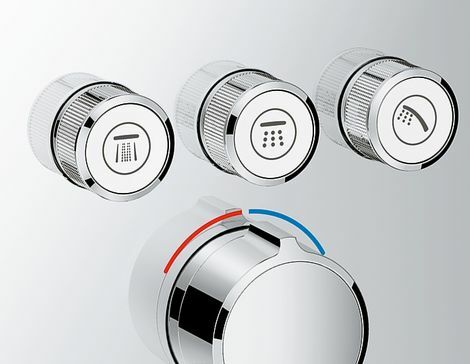 These symbols are clear and recognisable and their functionality distinct. 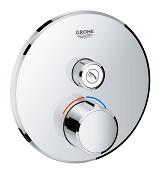 They can be individually configured and also easily exchanged if required. 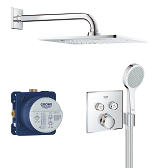 CONTROL UP TO 3 SHOWERS WITH JUST 1 TRIM: Today’s trend is for a multiple shower experience that offers more than simple bath/shower combinations. The downside is that for this to work, you need two rough-ins and two trims to control a hand shower and a two-spray head shower: up until now. GROHE Rapido SmartBox and GROHE SmartControl Concealed make it simple. 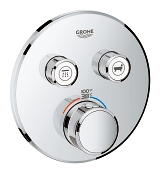 With just one rough-in and one trim, it is possible to enjoy two head shower functions simultaneously. Featuring up to three SmartControl valves plus thermostat or mixer in one trim, GROHE SmartControl Concealed means half the work for three times the showering pleasure. 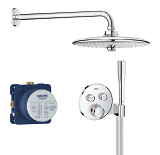 The pleasure of using two head shower sprays is enhanced by the Rainshower 360 and the new Rainshower 310 head showers. 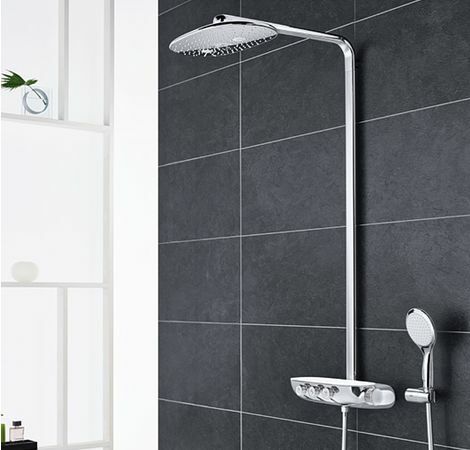 Designed to be the perfect match, they deliver an unmissable shower sensation. GROHE SmartControl Concealed comes in two different forms – round and square. 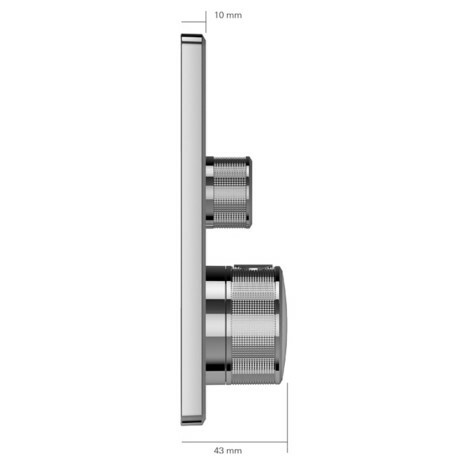 It also comes in two stylish finishes: classic chrome, for a subtly elegant design statement, moon white acrylic glass. 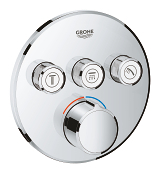 Each variant fits its matching GROHE design line perfectly. GROHE TurboStat technology lies at the heart of our Grohtherm thermostats. 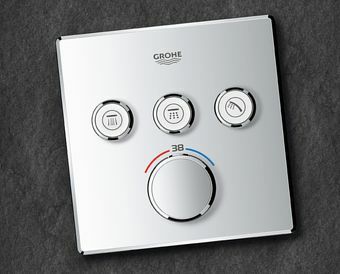 The thermoelement’s unrivalled sensitivity means it delivers water at the desired temperature within a fraction of a second – and keeps it constant for the duration of the shower. 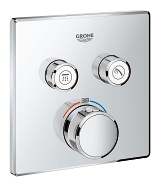 No more time, water and energy wasted getting the temperature right. 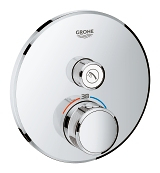 And if the cold water supply fails, it reacts instantly: the hot water flow will shut off automatically to avoid the risk of scalding. 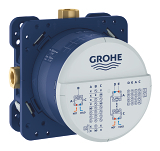 Grohtherm thermostats come with a 38°C SafeStop button and can be complemented with an additional limiter at 43°C. 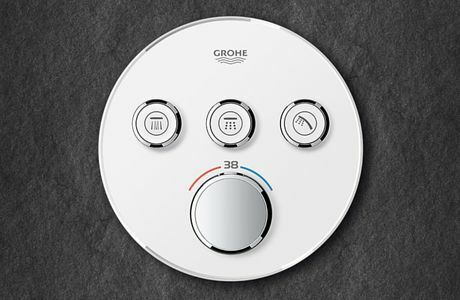 But more than just controlling the temperature, GROHE TurboStat compensates precisely for fluctuations in pressure for a consistently comfortable shower. are normally needed. Which is a huge savings in work and effort. The GROHE Rapido SmartBox makes adapters practically redundant. the GROHE Rapido SmartBox is designed to fit 90 % of all pipes. 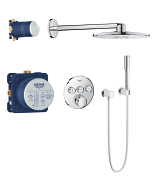 cold water supply. That makes 90° fittings a thing of the past. Why take a detour when you can take the direct route? Doing a perfect job comes down to getting even the smallest detail perfect. And once a job is finished, it’s usually hard to adjust mistakes. 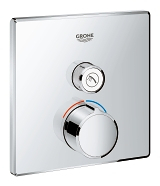 Not with the GROHE wall plates. 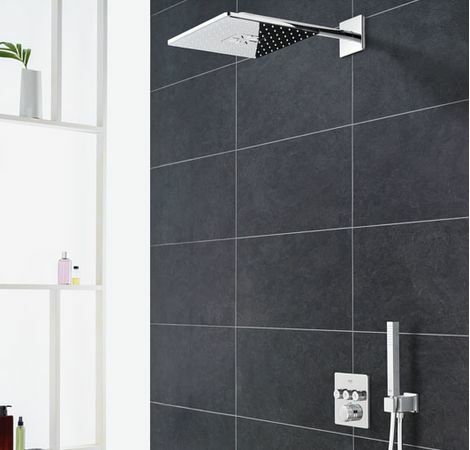 They can be subsequently adjusted by up to six degrees – thanks to slotted holes in the function unit – to allow for perfect alignment with tiles and tile joints. No drilling, no risk of damage. Just a job well done. 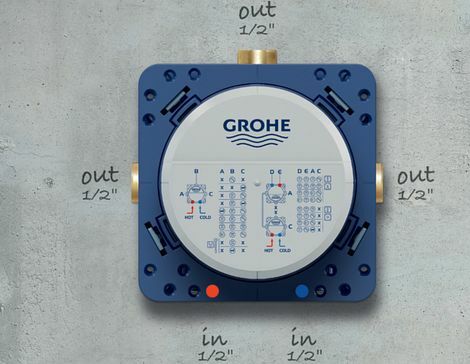 With its optional service stops for retrofit, the GROHE Rapido SmartBox gives you full control over the water supply in just a few steps. 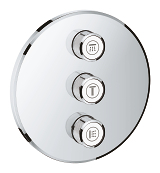 In case of maintenance work, each outlet in the building can be closed directly and separately - a clear advantage especially in hotels and apartment buildings. 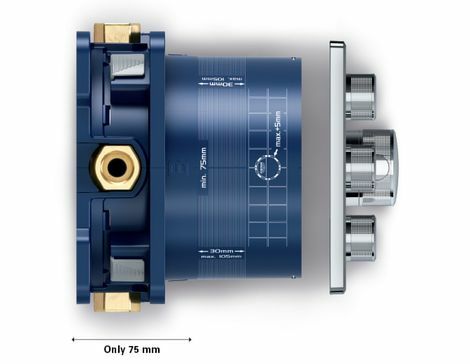 Service stops are available as a retrofit option for the basic rough-in and are easily exchangeable. 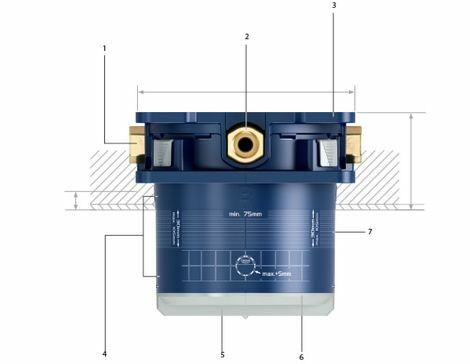 In Europe, every combination with an integrated bath-fill and an overflow unit must comply with the EU norm EN1717, to protect drinking water from contamination. 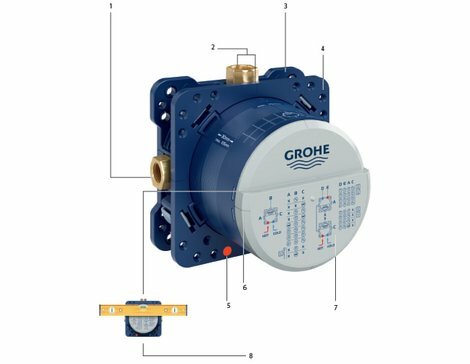 With a simple but clever backflow protection device, the GROHE Rapido SmartBox can be retrofitted to comply with the EU norm. 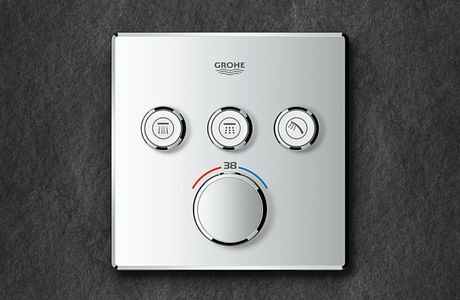 GROHE Rapido SmartBox is the smart innovation that enables fast and easy installation of rough-ins. 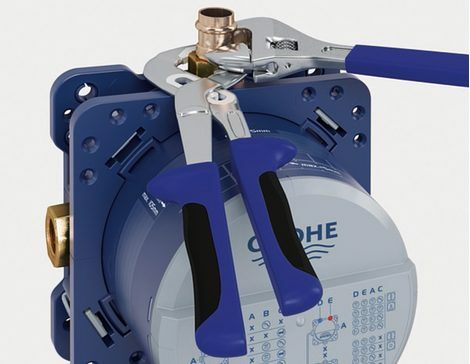 Thanks to brass outlets, which are readily accessible, the rough-in can be mounted using an adjustable spanner or pipe wrench, allowing for efficient, on-site installation.